Interested in joining trail-work in 2019? Detailed plans for outings May 28-June 4, July 20-Aug 4, and Sept 21-29 are here! The trail is well-marked and continuous for the first 7.9 map miles, then goes through alpine terrain for 4 miles with no markings or tread, and picks up again on the far side for the final 8.7 miles of trail down to Taylor Bay. The first 5 miles of the trail on the Tutka end are well enough developed to be hiked by most experienced hikers, while the remaining 16 miles is more of an "adventure trail" requiring some specialized skills, including river crossing, alpine navigation, and safe travel on alpine snow patches. By June 2019 we hope it will be possible to follow trails and routes continuously from Jakalof Bay to Taylor Bay - a total distance of over 30 miles. Join the Facebook Group to see photos and hear about people's experiences on the trail! Photo by Andy Banas: In late May, snow can still be thick on this 1200 foot peak. The tide can be a major factor when you're starting your hike. You can save a mile of hiking if you paddle in at a high tide to the original trailhead. But simplest is to arrive any time the tide is higher than 4 feet at the main trailhead, built in 2018. As of early August, there's no sign marking the start of the trail, but that's in the works! There is a map with details of tide-dependent access here. Once you're on the trail, it is pretty straightforward to follow. About 2.5 miles in there is a stream crossing, but some people have been corssing on a fallen log next to the ford. In places the trail follows steep, narrow bear trails. Near the end of the first 7.9 miles of trail, there are two river fords - both are well placed at the best route, however rain can quickly raise the river, so approach with caution any time when it is or has been raining recently. Beyond the end of the developed trail, the navigation is not very hard - you need to go through the left pass of the two that are visible from near the end of the trail, then drop down the other side. At a constriction in the valley on the far side a few miles from the pass, cairns on the right (southwest) side of the river will mark the start of developed trail that goes another 8.7 miles to Taylor Bay. This part of the trail has 5300 feet of elevation change going up and down complex cliffy slopes. 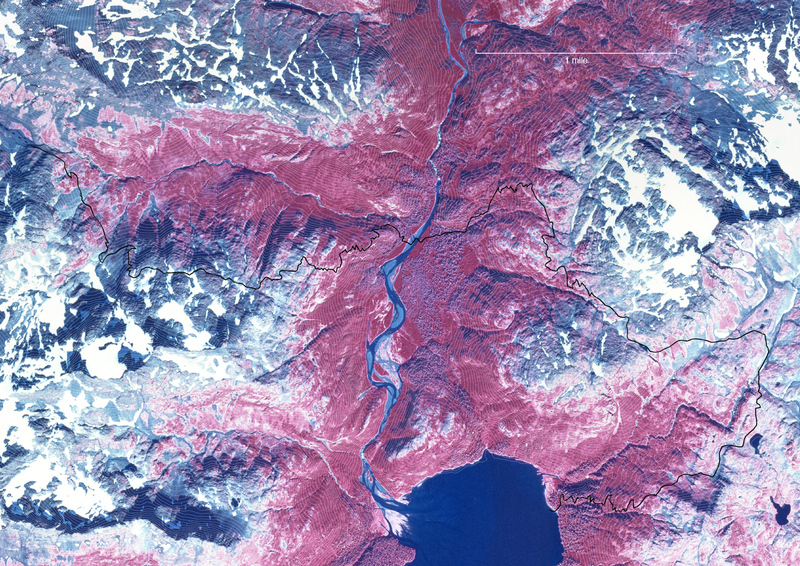 In it, there is a crossing of the Taylor River, which can be dangerous at high water - waiting for the water to lower, or packrafting across, may be required. Many of the steep traverses have tread, but some places require climbing sloping rock or traversing on slippery grass. Most of the time (but not late summer 2017) there will probably be patches of snow on the route, and we recommend an ice axe. One area where this snow is particularly challenging comes about 2.8 miles from the end on a long traverse - snow persisted in this area well into July 2018. Some hikers have had trouble following the trail, especially in the climb after crossing the Taylor River. About halfway along the new trail, Lunch Mountain provides views of where you've come from, and also looking back into the mountains. Most of the trail is in the wilderness park where developed campsites are discouraged. The only developed campsite is at the head of Tutka Bay, 0.6 miles from the trail start. It serves as an alternate start point. 5 miles from the trailhead there is a spur on the right that goes past a number of good camping areas - including a large open field at the end that has nearly unlimited space for camping, as well as rocky surfaces where building a fire won't leave a scar. In general, try to spread out your impact - if you can see someone camped somewhere before, pick a new spot so the vegetation there can regrow. Don't build fires in alpine areas, and only build them on hard gravelly surfaces. Be careful about going to the bathroom - burn, carry out, or deeply bury any toilet paper. Because the trail travels many miles through alpine areas there are abundant options for camping - no need to follow the herd! The last mile of the Tutka River is packraftable - you can float from a nice gravel bar to the mouth of the river. However the river is more challenging (class II) than it appears in the places where you see it from the trail - there are fast sections and many sweepers, use caution and scout! Packrafting is also an option in the tundra valley, where there's about 1.2 miles of class II water and possibly other runable sections. The Taylor River is floatable for 1.1 miles down from the trail crossing toward Taylor Bay. The river then descends into a bouldery canyon that is probably unrunnable, but a steep bear trail provides a portage to below the rapid on river left. From there it's a short float to the bay with one class II rapid. For a packrafter, this is a significant shortcut to the ocean, cutting off an entire climb and descent. Note the Taylor River can experience extreme flooding that completely changes the river - nobody has tried floating it in conditions other than very low water. Currently, to get to the trail you will have to either take a boat or a plane. You can take your own boat or a water taxi to the head of Tutka Bay, or take a boat or float plane to Taylor Bay. With some bushwhacking and off-trail navigating, it is also possible to enter or exit the trail system in other ways. You can walk from near Jakalof Bay to Tutka Lagoon, then up the Tutka Lakes Trail and beyond until you reach the mountains above the Tutka Backdoor Trail. On the south side of the peninsula, boat or plane pick-up is possible in other bays, though Taylor Bay is one of the most protected. Note that float plane landings are not permitted at Gore Lake. In October 2016, we cleared and marked an extension to the Tutka Lakes trail, covering about half the distance and 2/3 of the work needed to extend that trail to alpine tundra. When complete this will provide an alternative route to reach the passes above Tutka and ultimately the trail to the Gulf of Alaska coast. Right now, the route is well worth following - providing new views, off-trail hiking opportunities, and beautiful meadowlands. Drag cut branches away from the trail - there are a number of places where messy branches are near the trail. Drag these off out of sight. The only exception is places where the branches were used to cover bear trails - leave those in place. As of August 2018, one area that particularly needs this help is several long cuts across flat ground in thick willow and alder about 6.5 miles in. Hiding the biggest cut alders left here will be difficult, but much appreciated! It's very helpful to pull out salmonberry bushes near the trail. But don't pull out small spruce trees in brushy areas - once these grow a bit they'll help make the trail easier to maintain. Breaking or cutting salmonberries or other brush growing into the trail is helpful too - just leave overhead vegetation - the shade helps inhibit undergrowth. If you have a saw, cut branches that have been cut, but are long and sticking out. Cut them back to be flush with the tree, or back to a point where an uncut branch extends out. It's also very helpful to just know how people are using the trail, and about what issues they run into. Drop us an email, or post on the Tutka Backdoor Facebook group. If you use a GPS, and are comfortable with someone else seeing that data, it would also be great if you could send your trackline to contact@groundtruthtrekking.org. We can analyze these tracklines to better understand how people are using the trail. We won't share this data unless it is first anonymized. This section is not yet updated with 2018 improvements - we will put those up soon! 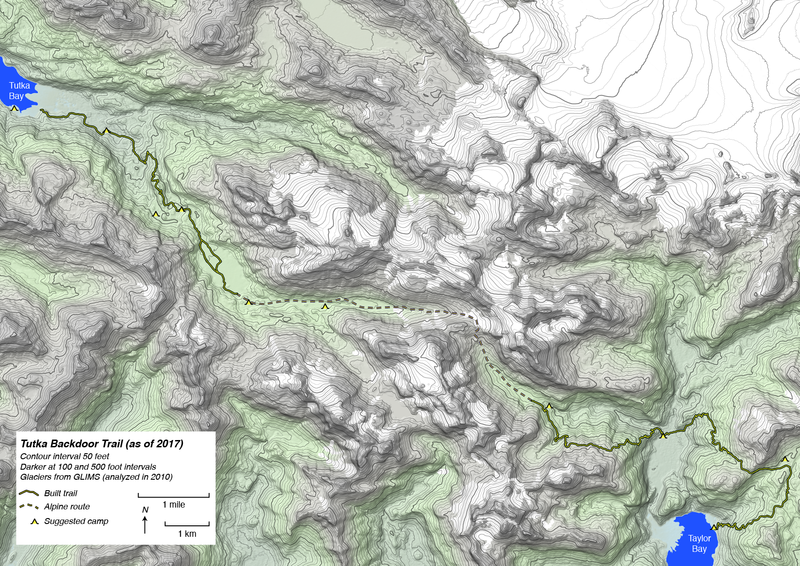 Trace of the trail as built in 2017, with plans for 2018 and beyond to open in Google Earth or a map just of the trails built as-of 2017 to upload to your GPS. If you want to print a map, perhaps this one or one of these (300 dpi jpgs) of the trail as-of 2017 from Tutka Bay to Taylor Bay would work. There's also one of the 2017 work, and some additional maps that may be useful to hikers. What we've built, and planned improvements for 2018.